Or wanted to ask them what they remember from before they were born? But as he’s gotten older, I don’t think of that as much. Until last night, as the Little Man was getting ready for bed…..
With arms swinging and a big grin, Bubbers headed straight for his room, retrieved his book off the ottoman and handed it to me. “Thank you!” I said as I sat cross legged on the floor. Still grinning, Bubbers turned around and backed up into my lap. Then Charming sat across from us and I handed him the book. Charming opened the book so Bubbers could see it and started reading. As usual, Bubbers carefully listened to his Daddy and looked at every page before turning to the next one. “Our Savior is fairer than all God’s creations,” Charming said, altering the words to include all of us. “He guides us through the darkness because He is the Light of the World,” Charming continued. “Yes, that’s Jesus!” Charming and I explained simultaneously. “He’s our Savior,” I told him as I pointed along with him. Bubbers turned the page again. “Our Savior is our friend and knows our every need,” Charming read. Suddenly, I felt Bubbers sit up away from me and lean a little closer towards the book. He just looked at Jesus. And got closer and closer. Until he finally touched the book with his sweet open lips. Charming and I stared at him. And then we stared at each other. “Did he just kiss Jesus?” I asked Charming in disbelief. Bubbers softly pulled back for a moment and then immediately leaned forward again, giving Jesus a long, precious Wooga kiss. 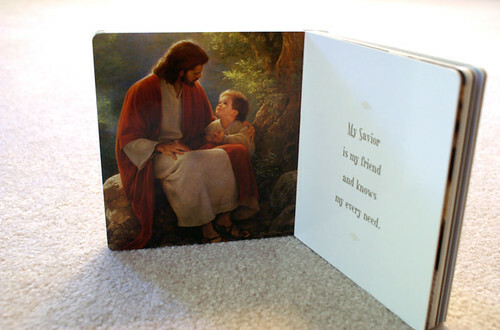 Bubbers turned the page, found the next picture of Jesus and leaned forward to kiss him. 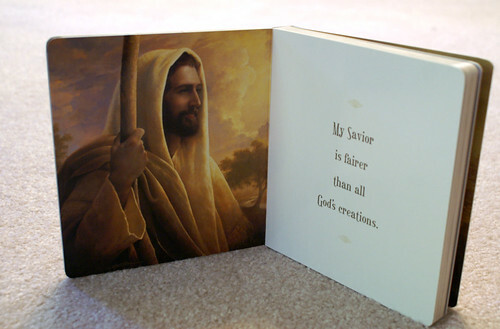 Bubbers commenced to turn each page and spontaneously kiss each picture of Jesus until the end of the book. 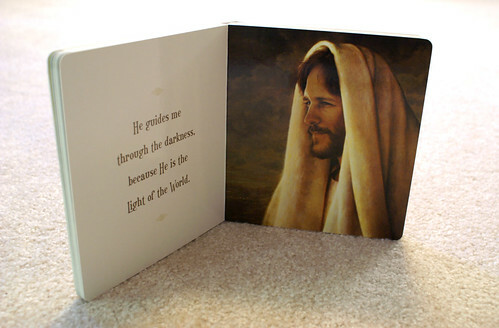 And then he kissed the picture of Jesus on the back of the book. All the while, his parents watched with hearts that swelled with love and faces lit up with smiles. And when they eventually laid their precious little son of God in his crib and hugged him goodnight, they looked at him with renewed appreciation in their eyes. Appreciation for a child sent from heaven. And then showed how much he loves Him. What a sweet tender moment! I’ve always wondered if they are still that close to the veil that they remember everything. i catch keoki smiling at the ceiling at something. it’s cute! i love your moments, thanks for sharing them with us! 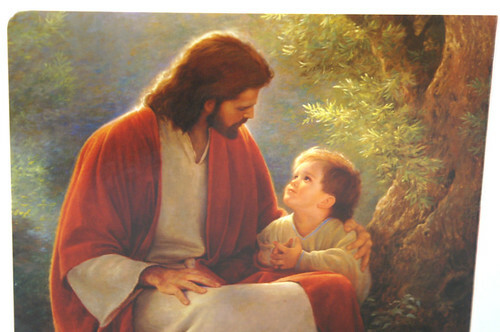 Isnt that cool how kids always seem to recognise pictures of Jesus? Elora always used to point them out on our walls, and she’d wave to them. I think she also kissed one of her books with him before too. How sweet. Children remind us of who we are and what we should be doing. Again, thank you for sharing such a touching moment. Such a sweet story. 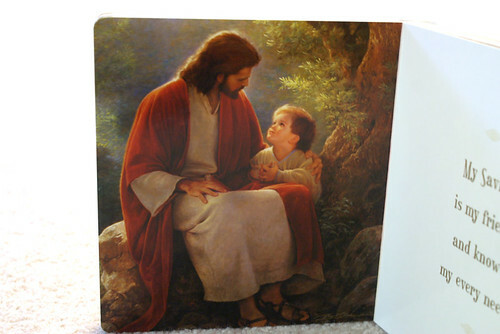 I remember similar moments with each one of my kids – like when Matt looked and the pictures of Jesus that I had taped above his changing table and said very clearly, “Dee-zus!” (and he was barely 12 mos. old!). 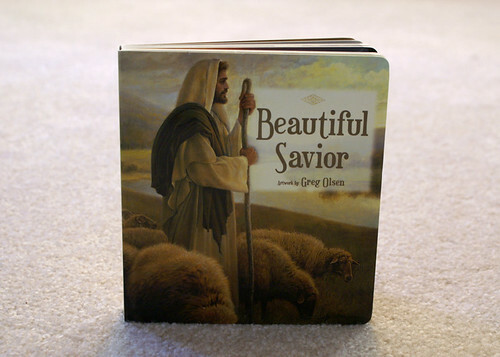 We have that same beautiful board book and use it during sacrament meeting. One Sunday Lizzy did the same thing – she kissed every picture, w/o any prompting from us or anything! I also love how kids will often recognize Him in paintings they’ve never even seen before. Very sweet. Kids remind us of the most important things. So very sweet! I’m glad you are treasuring each of these moments with Bubbers! Love baby kisses. Oh, I love all these stories! Thank you everyone! @Kara: I couldn’t get that link to work. :( I’m very curious to see what it is!